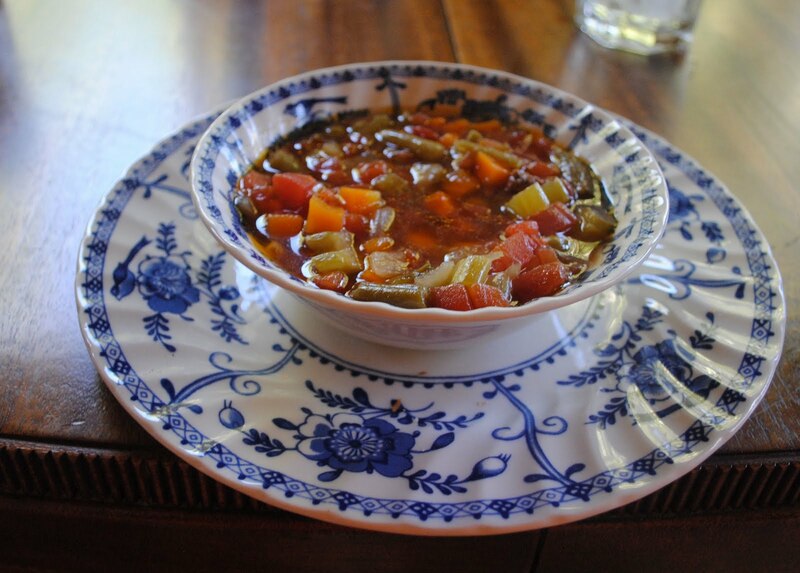 Sarah's Soup is her version of our family favorite Plaza III Steak Soup. From the famous Kansas City restaurant, Plaza III. She lives in Minnesota and makes it often during the winter for a warming bowl of soup makes a great lunch or dinner in snowy Minnesota. And even though when she was home and temperatures were still in the 90's, she made a big pot of her Plaza III Steak Soup for us. Which, even though it was warm, made for lovely lunches especially with hot from the oven Pillsbury frozen biscuits slathered in melted butter. The temperatures this morning (only 45 degrees) means that I'll put the last container of soup out of the freezer -- just enough for lunch on a chilly day. To go with, a pan of cornbread for the warmth of the oven shall feel good in the kitchen this noon. The original recipe for the soup is HERE. Daughter Sarah's version eliminates the thickener and I think it is great with or without! Most everything served at Linderhof is served in blue and white and Sarah's Soup was no exception. The Indies pattern by Johnson Brothers (which I share with Cass at That Old House). Its our "everyday" dinnerware which we've accumulated over the years. The "seed" was a wee teapot, sugar, cream and two tea cups which I brought home from a trip to England eons ago. And it's Monday which means that it's Blue Monday so please join Smiling Sally to see the other blues this Monday! Martha, this looks like just the right comfort soup for someone mending from knee replacement and shivering! I wish I had some to pull out of the freezer as our temperature is hovering at 52 degrees with a predicted high of 64. I am pulling out warmer jackets! M-m-m-. . .looks yummy! Sure to try this soup soon on the lonesome prairie! Thanks for sharing this recipe and for such a lovely blog. Your blue dishes are always pleasant to the eye! 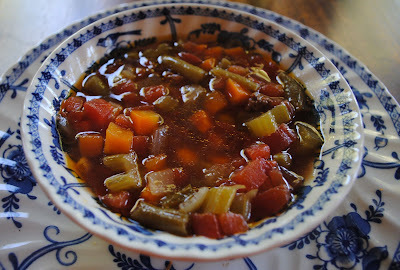 Rainy and cool today, and you just gave me the great idea to make soup!! I will check out the recipe, and since I usually put up two soups at once, I will also make a chicken soup...maybe it will help to keep the family one step ahead of the flu and head colds. Happy blue Monday. I'd love a bowl of that soup today. The soup looks delicious. We finally had a 50 something morning. YIPPEE! How tempting-I might be making that soup for dinner. It's so cool here today-a perfect ending to this fall day. Your's looks so lovely in that blue bowl. Beautiful blue china and what is in it looks delicious. That soup looks delicious - thanks for sharing the recipe. I love your pretty Indies blue and white china. It has cooled down today and is only in the seventies where I live in Georgia. On this rainy, dreary day, I think that bowl of soup in the lovely dish setting would hit the spot! that looks delicious. Happy Blue Monday. That looks delicious. It's cold enough up here this week, and rainy enough too, to make a bowl of homemade soup sound like just the thing! Hi Martha -- we have so much in common, sometimes I truly do think we may have been separated at birth! I peeked ahead at your Tuesday post. Tea does seem the right drink to offer mid-afternoon; I've got shortbread with chocolate on them for my Tuesday tea! I think I'll use "our" Indies, too. Although I don't have the pretty teapot! Also -- my soup/cereal bowls in the Indies are square, not round. How odd!